Bringing a 1970’s Ford Maverick dream into fruition. Replacing a straight six with a reliable Ford 302 Small block. Many individuals find themselves waking every morning with sudden reminisces of past dreams. These dreams may prove to be wide and varied from one individual to another. Most dreams end up being simply that-dreams. However, for the Mad Scientist (my father) one of his many dreams is slowly beginning to come true. On this page you will be able to see how the Mad Scientist’s Ford Maverick dream became a reality. 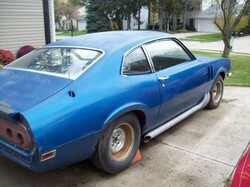 In fact, you will even be able to see pictures of the Maverick’s progression as it rapidly gets built in my garage. Over the years the Mad Scientist -and his brothers- would tell me stories of how he was known for overnight engine swaps in all sorts of automobiles during the late seventies. The Mad Scientist would tell me how his friends would break their cars and bring them to him in the evening, and surprisingly be able to drive them out his garage to get to school in the morning. Although the Mad Scientist was fully capable and willing to fix other individuals automobiles he was most proud of his own. At the time the Mad Scientist owned his own Ford Maverick Grabber. However, the Mad Scientist’s Ford Maverick was far from original. During the time engine parts were plentiful, cheap, and easy to come by. Instead of the exceptionally common six cylinder engine, the Mad Scientist’s Maverick was fitted with a Ford 302 small block with BOSS cylinder heads, an Offenhauser high-rise intake, and a four barrel Holley carburetor. To top it all off the car was fitted with the wildly famous double snorkel Ford Grabber Hood and an 18’ lift air-shock suspension. According to the Mad Scientist he was well known where he lived for having one of the fastest cars on the street. Unfortunately, as time passed various events in the Mad Scientist’s life began to unfold. Before he knew it, the Mad Scientist was married and had his first child on the way. The Mad Scientist’s wife eventually saw his Maverick as a dangerous automobile and he eventually came to the conclusion to sell it. Since the day he sold his car, the Mad Scientist has had several more children, helped them grow, and watched them leave. However, the dream of driving his Ford Maverick again remains. By the time I had turned 25 I had found myself in my garage rebuilding a Ford 302 small block to fit into my 1984 Mercury Capri with the aid of the Mad Scientist. At the time the Mad Scientist found himself overwhelmed with nostalgia as he slowly helped me work on my car. Living conservatively for the past few years and well within his means, the Mad Scientist told me one night that if I could find a reasonably priced Ford Maverick on the internet that he would be interested. After informing my wife that night we found a suitable Ford Maverick for the Mad Scientist. The following weekend we drove over 100 miles to pick up more than a car-a dream. The car was a 1970’s Ford Maverick with slight modifications, but it didn't matter because the Mad Scientist wanted it anyway. That night we spent the ride home discussing what would be needed to make this Maverick into exactly the kind of car the Mad Scientist wanted and remembered. Initially the Ford Maverick was fitted with a six cylinder motors and almost no interior creature comforts. The Grabber developed from mid-1970-1975, however the duel-dome or snorkel hood was only available in the 1971 and 72 Grabber models. The snorkel hood was utilized to give the car more of a muscle car look. All Grabbers were also fitted with a Ford 302 Small Block as well. Some of the notable modifications done to the Mad Scientist’s Maverick involved replacing the original 7 inch axle with a Ford 8” posi axle from an actual Grabber, cutting away rust and welding all damaged body panels, instillation of air shocks, replacement of stock front split bench seat with TenzoR Racing seats, shock tower shaving, fabricating and installing Torino Tail lights, and finally the instillation of 1987 Ford 302 Small block. Swapping the 7" with and 8"
Looking for Your Own Maverick? Ebay has several Mavericks for Sale! What do you think of modding the Mad Scientist's 1970 Ford Maverick? Can't say that I like it. You may have just destroyed a classic! Interesting, although it was not our original intent the Mad Scientist and I find that the modifications make the car look better. Since the acquisition of the Mad Scientist's Maverick several modifications have begun to stir. The Mad Scientist has since been able to fabricate a rear bumper and is working on shortening the length of the front bumper along with shaving the heads off of the bolts. These simple modifications brought the stock bumpers closer to the car and gave them a look as though they are floating. The Mad Scientist has also got additional aftermarket gauge pods in the works as well. If interested check out B3R Garage for more updates.